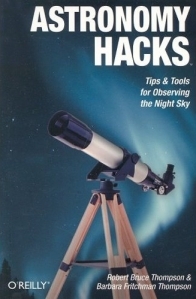 Astronomy Hacks is a highly educational and entertaining book set at a level which makes it an appropriate guide for experienced and novice observers alike. This was the first astronomy book written by Robert B. Thompson and his wife Barbara Fritchman Thompson and is a must have for your astronomy library. The authors' customary writing style contributes to making the book an easy read. The book has the sub-heading: Tips & Tools for Observing the Night Sky and as such the authors review their favourite assortment of concise hacks including the pros and cons of various types of binoculars, eye pieces and filters, along with discussions on exploring ways to fine tune one's eyes for nocturnal observing supplying us with quite a few useful "hacks" for use in the observing field. Need more information on star hopping? Interested in checking out how to locate objects geometrically? The Thompsons discuss observing hacks in the second chapter. Counterweights for your Dob? The third chapter ought to take care of it, along with other pertinent Dobsonian hacks. And what is the best 'scope to have? Is it a personal matter? See hack #9. You will also find quite a few well-researched answers to persistent questions in Chapter Two for Accessory Hacks. Urban observing skills, a highly sought after Star Pronunciation Guide, How-Tos for collimation and mirror cleaning, basic required equipment for celestial photography, understanding Celestial Coordinate Systems: Astronomy Hacks contains all this and so much more. Locating particular information throughout the book is extremely easy since the Thompsons have cross referenced frequently used material.